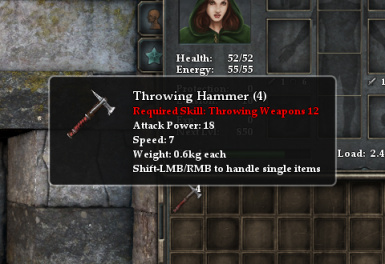 New type of throwing weapon that uses re-textured war hammer model and customised icon. 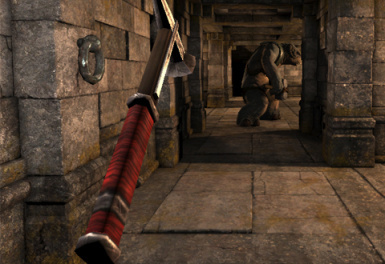 Original models and textures are copyright (C) Almost Human Ltd.
A tribute to good old arcade game - D&D Tower of Doom. Re-textured war hammer with customised icon. An end-game weapon for a rogue who specialize in throwing weapons. I've made it more powerful but slower then throwing axe to keep consistency with axes/maces logic of LoG. Also, because it's such a heavy weapon it requires some knowledge of throwing techniques to actually use it (Throwing Weapons skill level required: 12). 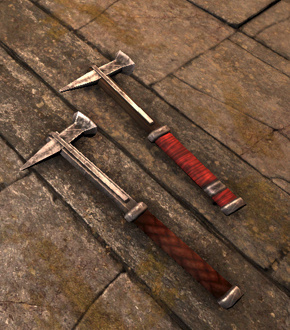 For re-texturing war hammer model I used GrimrockModelToolkit, created by JohnWordsworth.